Our aim is to provide you with a unique market and event that is tailored to meet your needs. If you have not yet planned your markets and events for 2019/20 we are in a position to offer you, your residents, visitors, tourists and local businesses alike, a unique shopping experience using produce and products from our extensive trader base. has over twenty years of experience within this industry and has worked in many towns too numerous to mention. The Business Development Manager previously worked for Ilford Business Improvement District as a project and events manager and was Town Centre Manager of the satellite town of Redbridge. Our chief Market Manager, who has a wealth of experience having worked as manager for Surrey County Council’s leisure and arts department. Last year we worked with a host of local authorities including, but not limited to, the Royal Borough of Greenwich, Portsmouth City Council and the London Boroughs of Redbridge, Croydon, Greenwich, Harrow, Newham and Waltham Forest (references on request). We arranged a variety of different markets such as Continental, Arts & Crafts, Alfresco Shopping and International Food Festivals offering foods from across the world. Everything is tailored to meet your requirements and expectations and of course we source local suppliers to compliment and enhance all events to help meet our aim of bringing vibrancy and added footfall to every town we visit. By trying to keep things local, we provide a wider economic value to boost local traders. 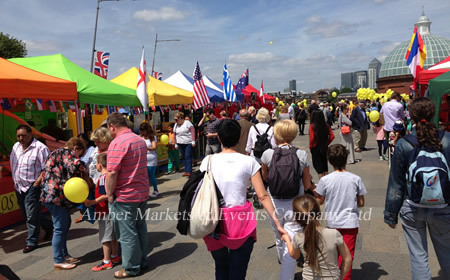 To ensure all events run smoothly and without incident, Amber Markets & Events Company Limited are fully compliant in all due diligence. Can offer a complete stand alone package and would be happy to meet with you to present our company in more detail, if you are interested. 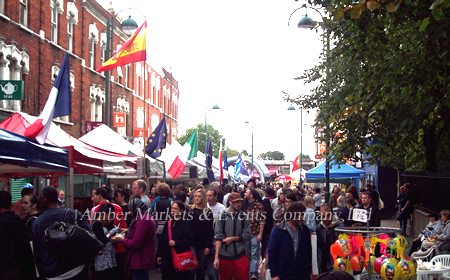 Amber Markets & Events Company Limited have £5,000,000 public liability insurance with GM Imber & Sons Limited.